These days, I'm a knitting fool. I'm working hard to rebuild my website design company, but with anything, it takes time. Clients need time to think about who to choose, then they need time to gather their information, then you put up the design, and they need time to review it. Once all the little changes are made, you invoice the client, and they take their time to pay. 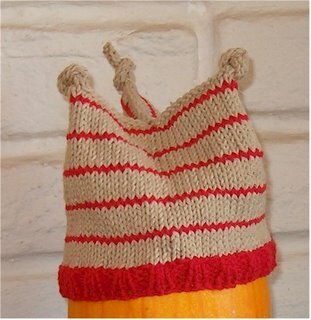 Therefore, I knit during all these "times" and sell my handicrafts online at Etsy.com to suppliment my income. I don't consider myself an experienced or accomplished knitter, but it's getting easier, faster, and I'm able to improvise more and more, modifying basic patterns to get new and unique looks and styles. The pictures I've posted are some of my most recent creations. 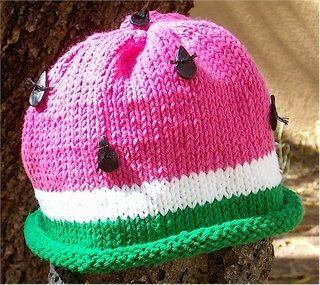 I think the "knotty jester" is just plain cute, but the watermelon in one of my favorites. It's really nothing more than a simple trick of colors, but the part I like most are the seeds. I created these "seed" buttons out of polymer clay, baked them, glazed them and then tied them onto the hat. It gives it a neat look and it's definitely a unique product. Sometimes new designs come out of necessity - like my elf hat. 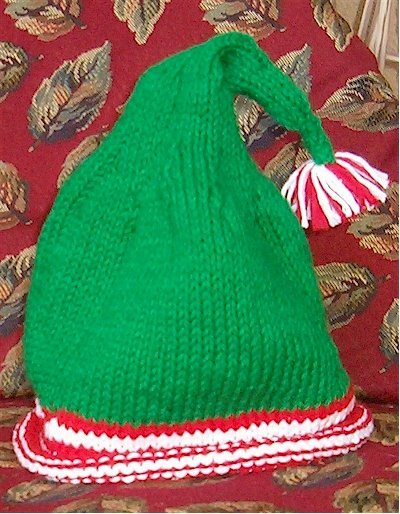 The original pattern called for red & white stripes over the total length of the stocking cap, but I quickly discovered that the red yarn I was working with was in short supply, and my backup supply was a different dye-lot (i.e. didn't match). So... I improvised and came out with a cut little tri-color elf hat. I've got millions more ideas. New ideas pop up seemingly with every stitch. I saw a pattern for a snowman hat - thinking I'll take a shot at that soon. Also found some cute crochet patterns I'd like to try - they work up so much faster than the knit ones. I've started a blank book with pictures of each piece and the pattern I used to build it. So far its a really cool collection.